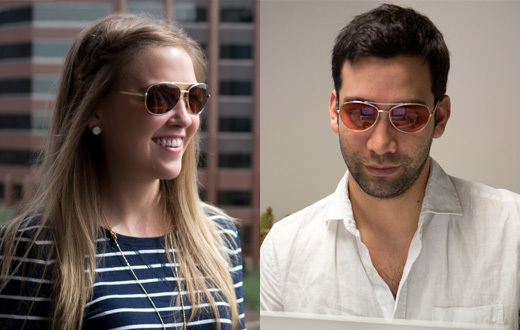 TheraSpecs are 20% off today! The prices on the website today reflect the discount. Indoor TheraSpecs are $99 (normally $129), outdoor are $139 (normally $169), and the already discounted indoor/outdoor combo is $199 (normally $258). 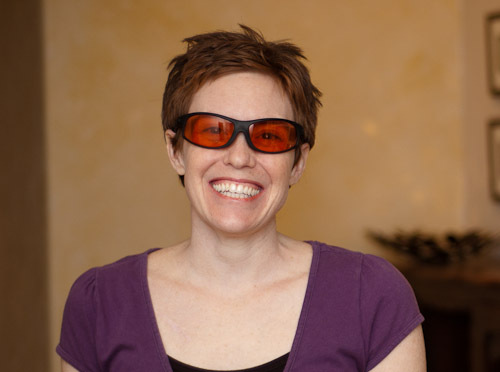 Please help Hart and me refine the future of TheraSpecs by completing this short survey about headaches, migraines and light sensitivity. It less than 20 questions and takes about five minutes to complete. At the end, you can choose to enter your contact info for a chance to win your choice of a pair of Indoor TheraSpecs or an iPod Shuffle. Several people have asked me what the wraparound FL-41 glasses that Hart and I are making look like, so here is a picture of them on on yours truly. One of the comments I’ve heard frequently (and so did testers) is people like that they can see my eyes when we talk, unlike when I wore sunglasses all the time. So I feel less cut off from the world, too. Upon arrival from Italy, the frames were held up in customs for a few days. After they were finally delivered at noon on Friday, Hart took them straight to the optical lab that makes the precision-tinted lenses. We hope they will be ready sometime this week. The website and shop will be up and running as soon as they are!